Today in this post I will tell you how you can download YouTube video in different audio format. There are many way to download YouTube videos and also ways to convert those YouTube video to MP3 but in case you want it in other audio format like OGG, AAC or WMA then how will you do, convert that video into MP3 then convert into the format you want. If you will do like, then it can destroy the quality of the video and also take a lot time. 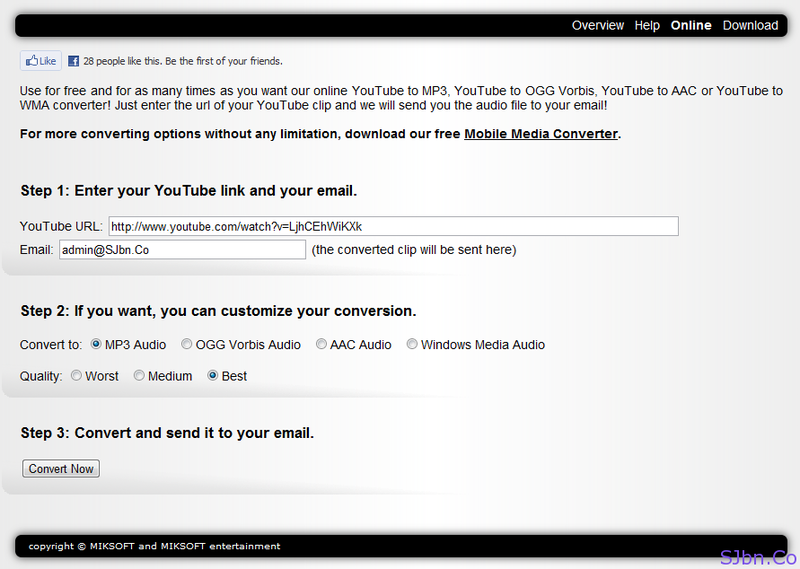 So you can use Mobile Media Converter online they let you convert any YouTube videos Convert to MP3 Audio, OGG Vorbis Audio, AAC Audio, and Windows Media Audio. You can also define audio quality in case if you want that audio file in low quality. You just need to go to miksoft.net/momeco.php and type the YouTube video URL, your email address (they will send you audio by email), select the audio format, select the quality and click on Convert Now button. they will email you video within few minutes, email can also go in SPAM/JUNK folder so check your SPAM folder also.